In a rush? Need your item shipped out the same day of purchase? We at T-Rex Racing, try our best to process all of our orders and ship them within 48 hours. Events such as holidays, out of stock items, customization requests, bad weather, and etc may delay the shipment. 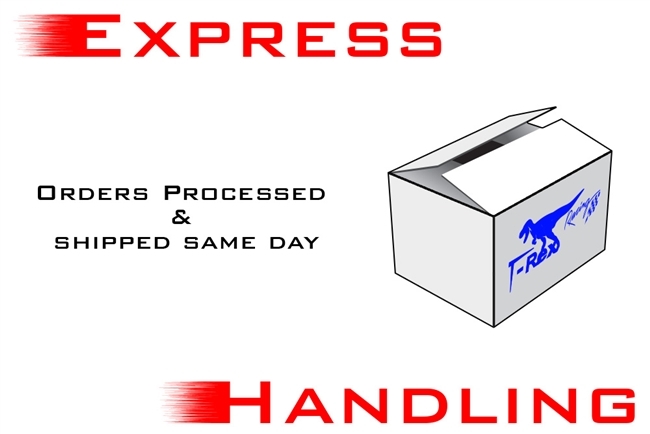 Express handling puts your order ahead and guarantees that it will be shipped out of our warehouse the same business day. This does not include the actual shipping cost of the order nor does it mean the shipping time will be faster. Order must be purchase before 2:00 PM Central time in order to be processed and shipped out the same business day. Express handling is ONLY valid during the weekdays as we are closed on the weekend and will not be processing any orders. Express handling purchased after 2:00 PM Central Time, will be shipped out the following business day. If purchased on Friday, item will be shipped out on Monday. We ship via USPS and FedEx. If they are closed the day of the order, we will ship it out the next business day. Large Orders may incur an extra fee.